SATURDAY HOURS will be 9 AM to 3 PM. Crystal Cleaners has been proudly serving the Puget Sound area for over 29 years, providing the highest quality, most dependable dry cleaning service possible. We are passionate about caring for and cleaning your garments to keep you looking fabulous and protecting your investments. Exceptional service and your continued satisfaction is the foundation of our business. We are a family owned and operated business, providing all major services on-site in the heart of Federal Way. Crystal Cleaners is pleased to have received several accolades over the years, including repeated honors in "Best Dry Cleaner of Federal Way" by the Federal Way Mirror newspaper's annual "Best Of" voters. We are also the only dry cleaner in Federal Way to have earned EnviroStars certification at the highest 5-star level. We use state-of-the-art equipment and technologies and do our very best to be green for our customers and the environment! Crystal Cleaners' laundered shirt service is second to none. 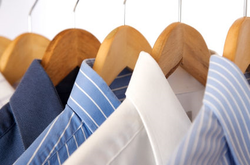 Most dry cleaners cheaply process their shirts as their "loss leader" items. But our customers experience confidence and comfort in the care of their wardrobe staples. At Crystal Cleaners, all collars and cuffs are pre-treated with stain remover, then washed and finished with your choice of starch level. Each shirt is then individually inspected after pressing and touched up by hand iron. All buttons are inspected and any that are not in perfect condition are replaced by us free of charge. Crystal Cleaners offers a full range of fine garment care and cleaning services, from individual apparel to home items, as well as expert tailoring and alteration services. So whether you are already one of our loyal customers or are visiting us for the first time, we appreciate your interest and invite you to come and experience the exceptional service and skill that sets us apart from the ordinary dry cleaner.